Onglyza Side Effects Lawsuits | Alonso Krangle LLP. A U.S. Food and Drug Administration (FDA) advisory committee has recommended that Onglyza, which treats Type 2 diabetes in adults, carry a warning on its safety label that use of the drug increases the risk of heart failure. The recommendation was based on a large study that found patients who took Onglyza had a greater risk of heart failure hospitalizations than those who did not take the medication. While the FDA’s Endocrinologic and Metabolic Drugs Advisory Committee was concerned about heart failure, the panel did not find an increased risk of cardiovascular death, stroke or heart attack with the use of Onglyza. While the FDA has not yet acted on the panel’s recommendation, the federal regulatory agency warned in August 2015 that DDP-4 inhibitors, such as Onglyza, may cause severe joint pain in patients who are prescribed the drugs to treat diabetes. Manufactured by London-based AstraZeneca, Onglyza is a popular drug that garnered $820 million in sales in 2014, according to Bloomberg Business. 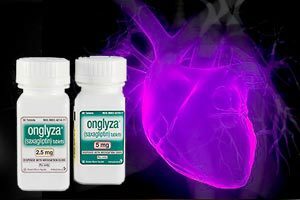 Alonso Krangle LLP is investigating Onglyza Side Effects Lawsuits due to heart failure and offering free Onglyza Side Effects Lawsuits due to heart failure legal consultations to those who may have experienced heart failure or other heart complications due to taking the diabetes drug. To find out the legal options available to you, please contact the Onglyza Side Effects Lawsuits due to heart failure Attorneys at Alonso Krangle LLP today. Onglyza (saxagliptin) was approved by the FDA in 2009 to help control high blood sugar in adults with Type 2 diabetes. Onglyza is in a class of drugs called dipeptidyl peptidase-4 (DPP-4) inhibitors that are used, along with diet and exercise, to lower blood sugar. In 2008, the FDA recommended that manufacturers developing new drugs to treat Type 2 diabetes provide evidence that their medication will not increase the risk of heart attack and other cardiovascular events. The guidance rule applied to all diabetes drugs which were being developed at the time, including Onglyza. In following the FDA’s order, SAVOR, a large, cardiovascular clinical trial was conducted on the safety and efficacy of Onglyza. For two years, researchers followed 16,492 patients who had Type 2 diabetes and cardiovascular disease or at high risk of cardiovascular disease. SAVOR discovered that patients who took saxagliptin had a 27 percent increase in the rate of hospitalization for heart failure compared to those who were given a placebo. The SAVOR study was published in the New England Journal of Medicine in October 2013. The FDA began investigating a possible link between saxagliptin and heart failure in February 2014, when it asked AstraZeneca for data from the SAVOR study. The federal agency convened an advisory panel meeting in April 2015 to discuss the SAVOR data. While the committee found heart failure linked to using saxagliptin, the panel said more information is needed regarding an increased risk of death from all causes linked with saxagliptin. Prior to its investigation of Onglyza, the FDA launched a probe into the link between pancreatic cancer and incretin mimetics, a new class of antidiabetic agents such as Onglyza. The FDA said it would continue to evaluate data regarding the drugs. Andres Alonso and David Krangle, attorneys with 40 years of collective legal experience, have focused their law practice on the handling of significant personal injury cases, defective drug and medical device litigation, construction site accidents, nursing home abuse, medical negligence, qui tam/whistleblower actions and consumer fraud cases. A nationwide law firm representing injured victims throughout the U.S., Alonso Krangle LLP is headquartered in Long Island, New York, with offices in New York City, and New Jersey.